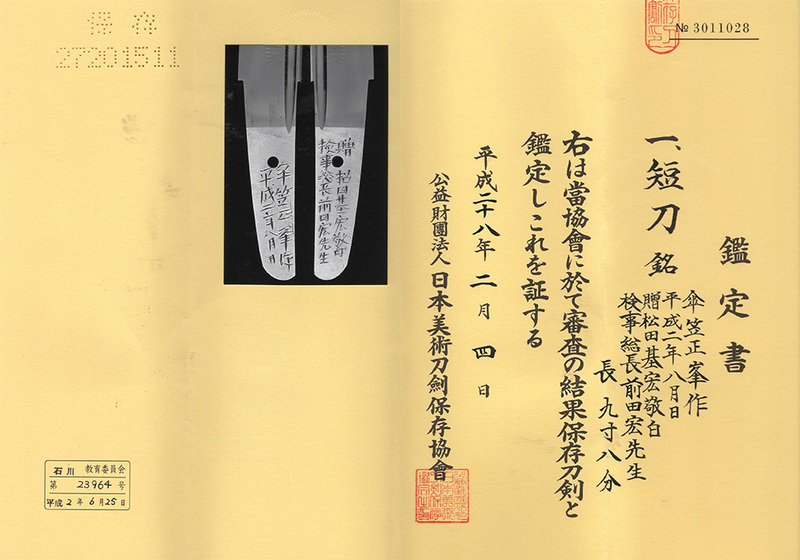 Explanation: Mr. Matsuda Motohiro presented the Attorney General Maeda Hiroshi with this Tanto. 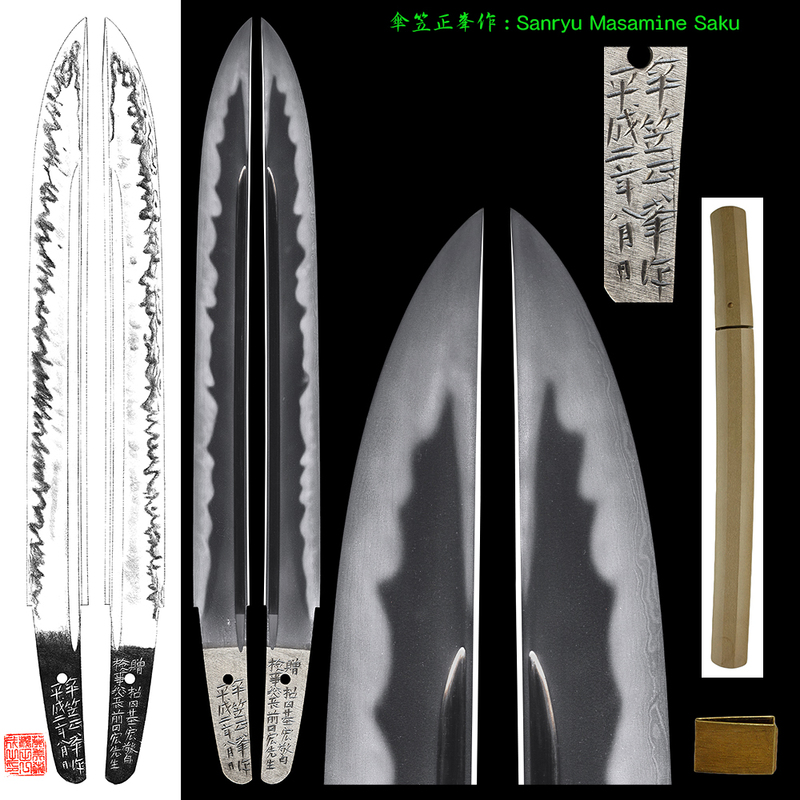 Jyo saku and regular saki)This sword belongs to Saijyo saku ranking. Blade length : 27.4 cm or 10.78 inches. Sori : 0.2 cm or 0.07 inches. Width at the hamachi : 2.86 cm or 1.12 inches. Kasane : 0.50 cm or 0.19 inches. Shape : Wide and thick nice shape Tanto. There are Bo-hi on both side. Jitetsu : Ko-Itame Hada well grained with Jinie attached. The Jinage is blackish and beautiful. There are wounderful Choji Uchuri. 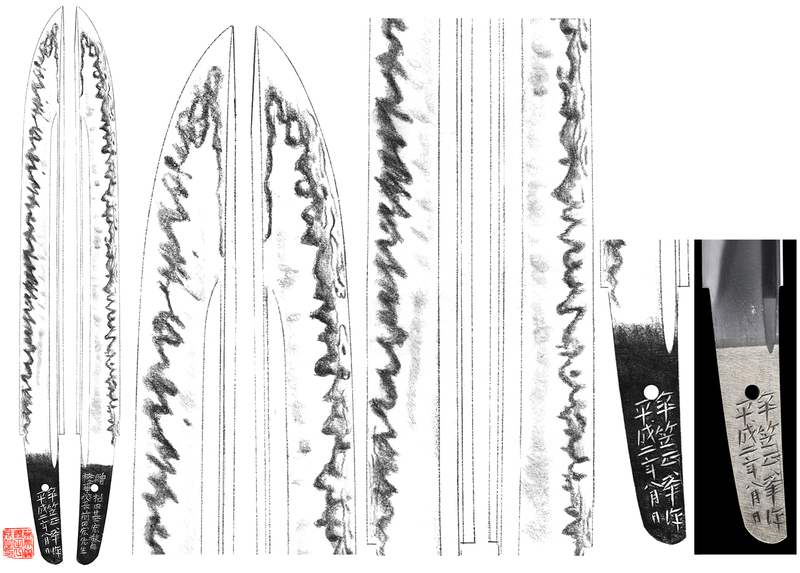 Hamon : Ko-Nie Deki, Sakasa Choji Midare with deep Nioikuchi. There are many Ashi. Special feature : Sumitani Masamine, born Sumitani Yoichiro in 1921 was a swordsmith in Ishikawa pref. the Second son of a famous swordsmith Sakurai Masatsugu. After that he moved to Onomichi city in Hiroshima pref. and learned forging and polishing sword at Kokoku Nihonto Tanren-Jo with his sworn brother Yokota Masamitsu. In the postwar Japan, Masamine set up his own smithy named Sanryutei in 1956 and studied Bizen-den. He forged special swords to dedicate the Ise-jingu shrine in 1964, 1966, 1969 and 1989. He became a Mukansa-tosho and a judge of the annual sword-making competition held by NBTHK in 1966. In pursuit of Bizen-den, he completed especially choji-midare hamon called Sumitani-Choji. He also studied old iron manufacturing in Kamakura period and reproduced classical texture of jitetsu. popularly known as Living National Treasures in 1981. He passed away in 1998. This blade looks like Aoe. There are many works in Ha. And also Utsuri is very nice. On the back of Nakago, there is the name Maeda Hiroshi. He have a military background. After that he became a Attorney General in 1988. We guess that Masamine made an intense effort to make this blade. Aoi Art estimatin paper : whole Oshigata.